Join us for this powerful book talk! Across the country over the past year, public school teachers have been striking for better working conditions, better pay, but most importantly, a better, more equitable education for all of their students. But this fight has been brewing for decades, and a new book shines a light on the intertwined injustices of systemic racism, high-stakes testing, and corporate overreach in U.S. public schools that led to 35 educators of color in Atlanta being slapped with felonies for allegedly changing students’ answers on standardized tests. 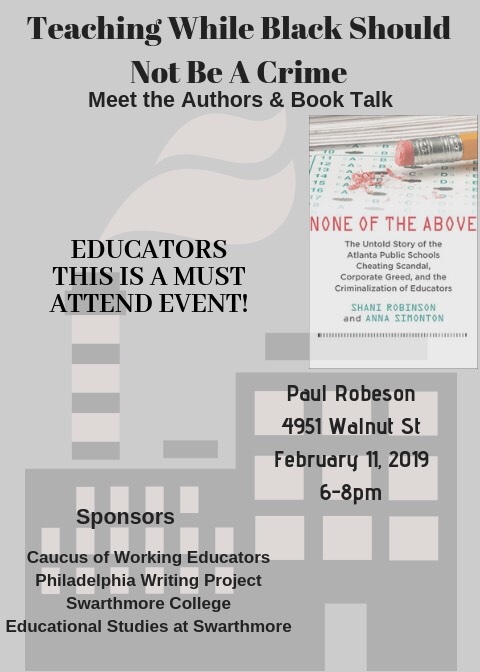 None of the Above: The Untold Story of the Atlanta Public Schools Cheating Scandal, Corporate Greed, and the Criminalization of Educators is an honest and courageous account of Shani Robinson, a former educator whose life continues to be turned upside down for a crime she did not commit. The book links Shani’s personal experience to the political and historical context that set the stage for the cheating scandal. It explores how racist policies and practices cheated generations of black and brown children long before some teachers tampered with tests, and continues to do so today.